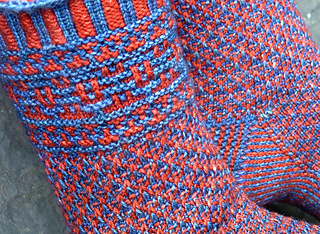 Slipstitch colorwork mosaic socks knit from the cuff down with heel flap and gusset, reminiscent of Turkish mosaic tile. Part of the Sailing To Byzantium Collection, designs inspired by the art and architecture of ancient Constantinople. Designed for the Malabrigo Freelance Pattern Project 2011. Slipstitch colorwork is very dense and firm. 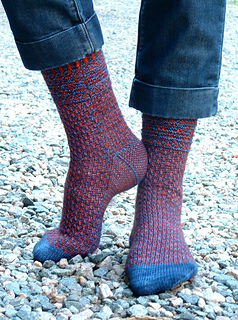 The nature of the fabric makes this a snug fitting sock; more stitches are CO than may be typical for a given size. Yarn: approximately 210-230 yards each of MC and CC. 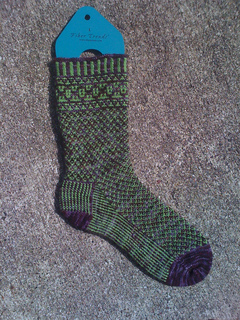 Techniques Used: Long-tail cast on, corrugated ribbing, slipstitch colorwork in five patterns, knit/purl, grafting. Experience Level: Intermediate. This pattern contains full written instructions, as well as charts for the slipstitch colorwork. Thank you to my wonderful tech editor Kate Vanover, and my lovely testknitters! 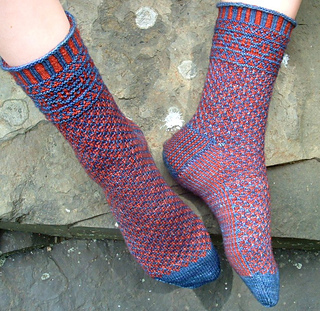 For questions or chat, please visit my Ravelry group, The Knitting Vortex.